A RUP LIFE: The Boss Baby in theatres Friday (3/31) Review & Trailer! 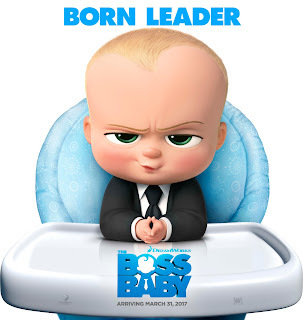 The Boss Baby in theatres Friday (3/31) Review & Trailer! A few weeks back I had the opportunity to see a early premier of The Boss Baby with my three older boys. We got up early on a Saturday morning and headed to a theatre in Cherry Hill. Armed with popcorn we embarked on what I'm going to tell you is perhaps the funniest kid's movie since The Lego Movie. We all laughed, I shed a few tears and the kids from 6-16 enjoyed this one! First off Alec Baldwin was perfectly cast as the baby in this film. We have always loved him from his days with Thomas the Tank Engine. He has a great voice that is perfect for the little dictator in this movie. The movie itself is adorable. The family gets a new baby but this baby isn't like other babies - which the big brother soon finds out. This movie was cute from opening to ending. There is a sequence in the opening credits where the babies are all 'made' so you might have a child asking about how babies are made and where they come from - in the movies case they are sort of from a factory - think stork type story with a modern twist. I thought my 6 year old would ask questions but we just had a baby a year ago so he knows they come from mommy's tummy. Overall this movie was totally wholesome, clean and great family fun. We will be buying this one when it comes out on DVD. The cute one liners - Cookies are for closers - made this movie jump to the top in my favorite kid's flicks. Enjoy the Trailer and let me know in the comments if you will be seeing this one! ARupLife.com received free tickets and press to facilitate this review. This post may contain affiliate links, which means that by clicking on an affiliate link I may receive a small amount of money. We only give our honest opinions of products. This post is in accordance with the FTC 10 CFR, Part 255 concerning the use, endorsements or testimonials in advertising.